In the early Eighties, 3-D flicks enjoyed a minor resurgence. They didn’t stick, but we got a smattering of them, some of which inevitably connected to the third movie in a series. 1983’s Jaws 3-D and Amityville 3-D tied to this trend, as did one of the earliest of that era’s bunch, 1982’s Friday the 13th Part 3. It doesn’t take long for us to see the 3-D roots of Part 3>. The opening credits zoom out at us, and we quickly witness silly gimmicks like poles, snakes and yo-yos that pop out of the screen. This transfer doesn’t actually give us 3-D, of course, but we can easily detect the vestiges of the format’s goofy conventions. While the 3-D of Part 3 never rises above Dr. Tongue levels, at least that element gave the theatrical release something unusual compared to its predecessors. Without the gimmick, 3 turns into just another rehash of the first two movies. This makes it a disappointment after the relatively strong Part 2. Yeah, that flick also told the same basic story as the first, but it tightened the general model and provided some decent thrills. In 3, the filmmakers totally rely on the 3-D gimmicks to entertain the audience, as everything else about the movie lacks creativity. They needed to try harder. Many of the fake-outs and false endings of 3 come as genre staples. I can’t really criticize them because they’re expected and appropriate parts of this sort of film. However, it’d be nice to see more imagination in them, as none of those elements stands out as memorable or vivid. Instead, the “twists” are predictable and add no life to the movie. If not for the fact that Jason obtained his signature hockey mask here, absolutely nothing memorable would come from Friday the 13th Part 3. It relied on its wince-inducing 3-D effects to involve the audience. Those didn’t work theatrically, and when seen in 2-D form, the movie becomes even more boring. 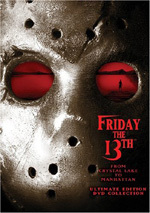 Friday the 13th Part 3 appears in an aspect ratio of approximately 2.35:1 on this single-sided, double-layered DVD; the image has been enhanced for 16X9 televisions. 3 offered an erratic picture that went from very good to pretty mediocre in rapid succession. Sharpness came across as spotty but mostly positive. Some shots looked a bit soft and ill-defined, but these stayed in the minority. I believe that the 3-D process was responsible for some of these issues. But it didn’t matter much, as the film usually seemed nicely delineated and concise. I noticed no jagged edges or shimmering, and edge enhancement remained minimal. Colors varied. The tones occasionally appeared moderately drab and dull, but the majority of the movie presented reasonably vivid hues. The outdoors shots looked best, as these presented nicely distinctive colors. Blacks were generally solid, though they could be somewhat inky, while shadows tended to come across as a bit dense. They weren’t terrible opaque, but they lacked great clarity. The image of Part 3 almost fell to “C+” levels, but I felt it presented enough strengths to land a “B-“. In any case, it offered the weakest visuals of the first three movies. As for the monaural soundtrack of Friday the 13th Part 3, it fell into line with the audio for the initial flicks. Speech remained crisp and intelligible, though it sounded moderately tinny at times. Effects lacked heft but demonstrated adequate clarity and definition. The score still showed too much high-end response and not enough bass, but the music came across as reasonably clear and tight. Nothing excelled but nothing really faltered, so I thought this was another pretty mediocre mix for a 22-year-old flick. This version of Friday the 13th Part 3 comes as part of a package entitled From Crystal Lake to Manhattan - Ultimate Edition DVD Collection. It gathers the first eight Friday flicks onto four discs and adds a fifth platter of supplements. Since Paramount designed the set as a connected package, I didn’t give the individual discs grades for supplements; I’ll reserve those for an overall review of the fifth DVD. Half of the eight movies include no supplements, but Part 3 comes with an audio commentary. We hear from author Peter Bracke and actors Dana Kimmel, Richard Brooker, Paul Kratka and Larry Zerner. All five sit together for this running, screen-specific discussion. The commentary covers the actors’ experiences well. We learn about their casting, prior knowledge of the series, working in 3-D, the atmosphere on the set, character issues and story changes, cut sequences, and various production anecdotes. Bracke asks good questions and helps keep the track moving at a nice pace. The actors seem to enjoy each others’ company and interact well to lend the chat a strong energy. It’s a fun and fairly informative look at the early years of the Friday series. Possibly the most witless and inane movie in the series, Friday the 13th Part 3 suffers from many problems. The original 3-D effects look even dopier in 2-D, and since the film uses those to entertain rather than any form of storytelling or characters, the flick never turns into anything positive. The DVD offers pretty average picture and audio plus an interesting and useful audio commentary. Watch Part 3 only to laugh at its incompetence; the movie doesn’t work in any other capacity.